If you’re looking for a decent date, it’s just best to hit the pass button if you come across this guy on a dating app. Apparently the man is known for attracting women online, then dining and dashing while on the date. A woman came to CBS Los Angeles with her story about what happened to her during a date with a guy identified as Paul Gonzales. “He said, ‘Are you available at all this weekend for dinner?’ I said, ‘Yes, how about Sunday?’” the woman, who didn’t want to be identified, told CBS Los Angeles. They met at BJ’s in Pasadena, Calif., and then he ordered right away: a glass of wine, a Caesar salad with a side of shrimp, steak and a baked potato. The woman said that the man downed his meal in record time and then got up. “He left maybe half a baked potato and then received a phone call and said, ‘I need to take this call,’ ” the woman said. The woman went online and discovered that this was not Gonzales’ first rodeo. Stories about the man described how he dined and dashed last summer, leaving at least two other women with hefty bills. Another woman said that he was using the dating app Bumble under the name Dave Gonzales. That profile has since been taken down. “I was shocked that anybody would do this. And I even texted him: ‘Is everything OK?’ And obviously he never responded,” she said. Police say that the elusive man is also accused of a “snip and ditch,” when he was seen on security footage leaving a hair salon while still in a smock after getting a cut and color last year. 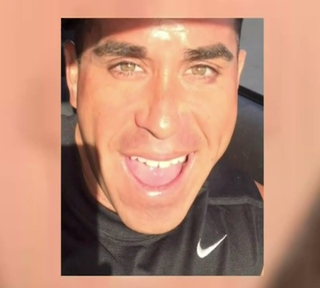 The L.A. County District Attorney’s Office said that Gonzales, 44, has two bench warrants out for his arrest after not showing up to court on charges of petty theft and driving without a valid license. He has reportedly been to jail several times for misdemeanor arrests. In the meantime, L.A. ladies, just swipe left.